Discussion in 'Transformers News and Rumors' started by Predakwon, Oct 14, 2015. 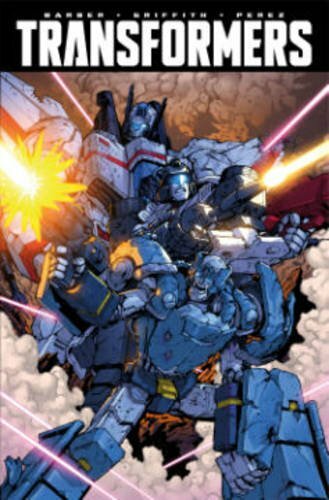 So is this Armada Omnibus a IDW re-release of the Dreamwave Armada comics? ^That's what I'm guessing, since without covers and stuff, the series' eighteen issues (22 pages each, right?) would total about 400 pages. Thanks for sharing. This may be a good time for me to dive into some Dreamwave stuff. I would question re-releasing Dreamwave crap, but I guess keeping it around is a great way to not repeat its mistakes. "Transformers volume 8 will likely pick up with issue #39 of the ongoing Transformers title." No, #39-41 are in the Combiner Wars trade (along with Windblade v2 #1-3). This will probably be #42-45. Ah right, totally my bad. I'm on Vol. 7 now. Huh, I've recently been thinking about checking out DW's Armada comic. Personally I think Dreamwave Armada was worst then the Armada anime. The Dreamwave version feels more generic and not as memorable. I own a volume of the comic, i wasn't impressed. Why would they re-releasea comic WITHOUT the full and proper pages from the original? Unless this version is significantly less to buy than said original colleagues comics, then IDW can go do one. I simply cannot understand how IDW doesn't "get" the idea of collected comics. They're the comic equivalent of DVD boxed sets. That's why noone bought the regular LOTR boxed sets; because everyone was waiting for the "full" director's cut, which is now seen as the "normal" version. I don't understand how IDW does reprints either. On one hand, I give them tons for credit for collecting stuff never collected before (some Devil's Due G.I. Joe issues and Marvel UK issues). But on the other hand, WTF with things like missing covers. How hard is it to include all of them? It's not like they have to make new art. Um, so do we have any idea when the remaining issues of Windblade will be collected in TPB? And what about the Combiner Hunters one-shot? It's really annoying we don't know anything yet.